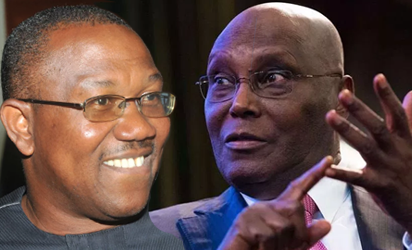 Dr. Nicolas Felix and Barrister Chuks Nwachukwu, Presidential candidates of the Peoples Coalition Party, PCP and the All Grassroots Alliance, AGA, respectively, announcement their endorsement of Atiku at a press conference in Abuja on Tuesday. “On this note, we are urging all our supporters and millions of youths across the country on February 16th 2019 as they go to the polls, to vote for Alhaji Atiku Abubakar. An Atiku-led government, he noted will provide job opportunities for the youths as well as revamp the ailing education sector. “Under him (Atiku), our power sector would deliver not only to the few but every citizen of this great country. “Under him, we can have a restructured Nigeria where the opinions of all would be heard and examined without being marginalized. The judiciary, the most sacred of our institutions, has been the latest victim- stripped naked of its dignity and self confidence in the market square,” he stated. Atiku was represented at the event by one of his long time associates, Elder Chike Obi. Previous articleA passerby heard a newborn crying in a storm drain. Four hours later, she was rescued.